former prime minister resembled nothing so much as Francis Maude done up as a drag queen. Plucked and buffed, caked in makeup, his whole face gurned and twitched, the eyebrows and teeth performing a bizarre kind of eightsome reel. The man’s discomfort in his own skin was disturbing to witness. The figure who greets me this week in the London office of his new Institute for Global Change is unrecognisably altered. The facial dance has vanished and he is strikingly composed; performative agitation has been replaced with centred gravitas. The cadence of his speech has changed, too; the curiously verb-less sentences are gone, along with the faux glottal stops. But then, lately, an awful lot about Blair’s life has changed, too. 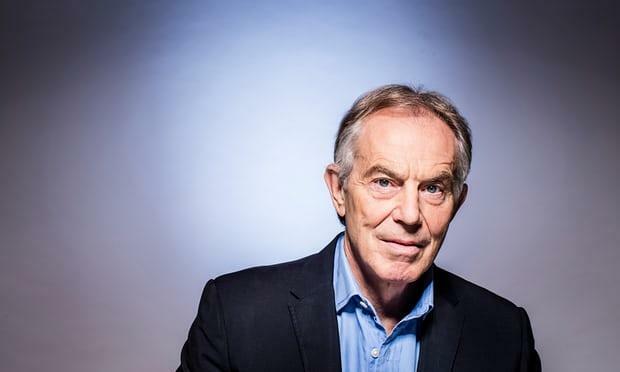 In autumn last year, he announced the closure of Tony Blair Associates, his private business empire, and the winding up of complex and controversial financial structures that have earned him so many millions and so much opprobrium. Reserves of £10m, and henceforth 80% of his time, would be devoted to his not-for-profit work. Aged 64, he is returning to frontline British politics using his institute as a platform to promote progressive centrist policy ideas and combat the rise of populism. He categorically denies any plans to create a new political party, but confirmed last weekend that he has fully committed himself to a mission to reverse Brexit. Blair is perfectly aware that many, not least on his own side of the argument, consider him so toxic that any intervention on his part can only be counter productive. I’m curious to know if he factored this in before deciding to, as he has put it, “stick my head out the door” and “get a bucket of wotsit poured all over me”. Blair believes it is still possible to prevent us leaving the EU, through a combination of grassroots pressure and parliamentary opposition. His problem, of course, is that, notwithstanding this government defeat on the EU withdrawal bill, his own party refuses to oppose Brexit. Still the legendary political operator of our time, Blair refers to “strategy” with the kind of objective respect a racehorse breeder might accord to a rival’s thoroughbred. I wonder if Blair might, like many passionate remainers, be underestimating the public ferocity towards politicians who tell them they voted the wrong way in the referendum. Blair’s faith in the politics of the centre ground remains as ideologically implacable as Corbyn’s faith in socialism. But when the demographic centre of property-owning, middle-income middle classes is collapsing, is the political centre even relevant? But if nothing matters more to Blair than Brexit, presumably it’s even more important than our relationship with the US. What I don’t understand, I say, is why he doesn’t desist from making comments about Corbyn and Trump that will only alienate the very people in Britain he is trying to win over. Telling them they’re wrong about Corbyn, and wrong about Trump, feels like more of his old compulsion to chastise the left. I can’t decide which surprises me more – Blair’s resolve to privilege speaking his mind over strategising, or the impression he conveys of a man restored to peace with himself. The two are almost certainly not unrelated. But I think I detect something else in his air of calm authority. Iraq had always seemed to be almost entirely about him – first as a vehicle for his ego, then as a battleground of his reputation. What makes his campaign against Brexit feel very different, and compelling, is a sense that it has little to do with him, and everything to do with the issue itself.